Inma of la Galletika was our Sept. 2013 Daring Bakers' hostess and WOW did she bring us something decadent and delicious! Pastel de Tres Leches or Three Milk Cake, creamy yet airy, super moist but not soggy...just plain delish! Traditionally, this recipe call for a sponge cake that is cut in half and drenched in a combination of evaporated milk, condensed milk and heavy cream. Then, one side is coated with a layer of whipped cream and fruit before it's topped with the other half of the cake. 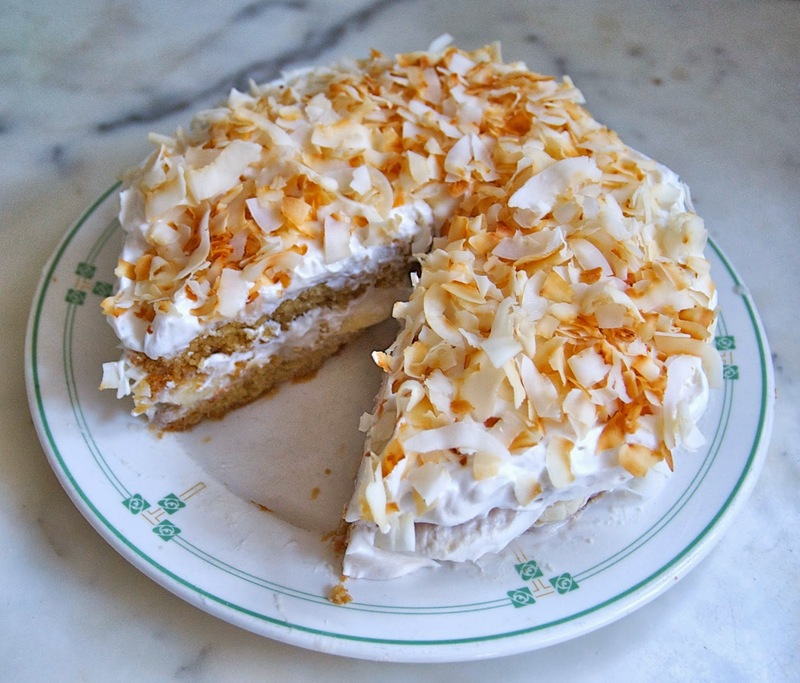 My vegan version of Tres Leches involves 3 types of coconut milk; canned full fat coconut milk, coconut milk creamer and coconut milk beverage. I made an eggless sponge cake and substituted whipped cream with Soyatoo whipped topping for the filling, I added a layer of sliced banana and topped the whole thing with toasted coconut. It's really a very tasty cake! If I made this again, I would probably fill the center with fresh pineapple. I do love the combination of coconut and pineapple together. 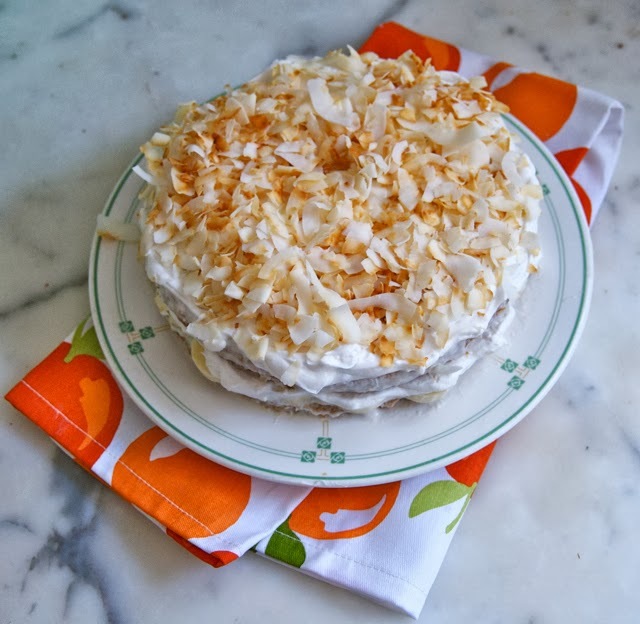 This is a wonderful summer cake, light and creamy. Refrigerate any leftovers. Line the bottom of a 8" spring form pan with parchment. Grease or spray the pan, sides and bottom. Mix the coconut milk together with the vinegar and set aside. Mix together the cake flour, corn flour, sugar, baking powder and soda. Add the oil and extract to the coconut milk mixture. Pour the liquids into the flour mixture and stir to conbine. Bake for 35-40 minutes or until done. Cool the cake for 15 minutes and remove from pan. Combine all three coconut milks in a heavy sauce pan. Simmer over a medium heat for 5 minutes. Paint each half of the cake and sides with the coconut milk combination until it's all absorbed. Put the coconut in a frying pan over medium low heat. Stir continuously until lightly toasted. Whip the Soyatoo according to the directions on the box. Spread half of the whipped Soyatoo on one half of the cake. Top this with the other half of the cake. Spread the remaining Soyatoo on top of the cake. 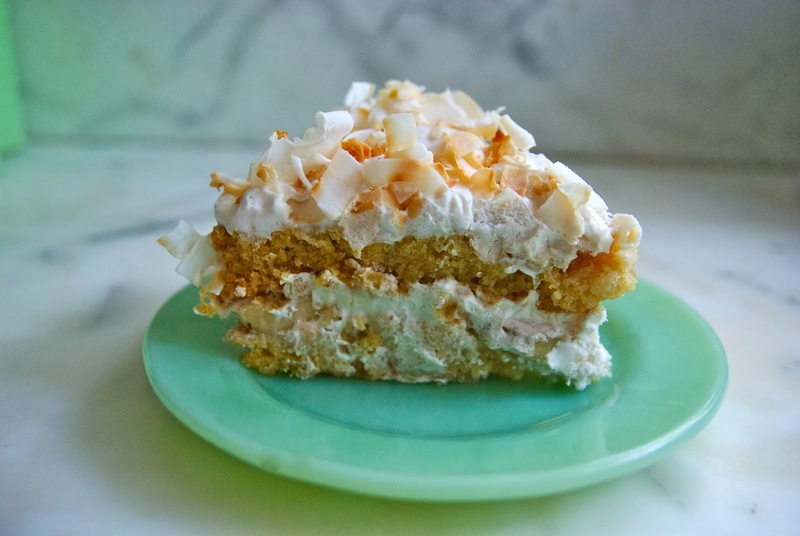 Top the whipped cream with the toasted coconut. 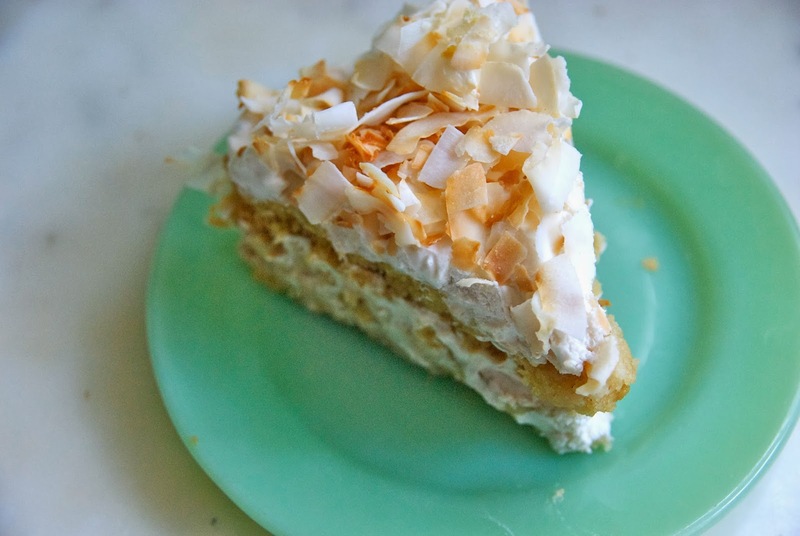 Your toasted coconut looks beautiful. Pineapple does sound like it would go well with the coconut. Nice job on the challenge! great job. I always love to see how people take the challenges and work them to their own dietary needs.